If you suspect that you need some professional help with your wardrobe, you’ve come to the right place. Image Consultant Rita Noon has helped women of all ages and occupations change their lives by changing their wardrobes… and saving money on clothes at the same time. Using a combination of proven techniques, Rita can teach you in a few short hours how to dress for your unique body shape and skin tone. Rita has just launched her first ebook, Get Dressed, Not Stressed, a treasure trove of fashion makeover secrets for women of all ages, shapes and sizes.If you’ve ever felt you could look much better than you do – if only you knew the right clothes to buy – this may be just what you’re looking for.To learn more about what’s covered in the ebook, please click on this link. 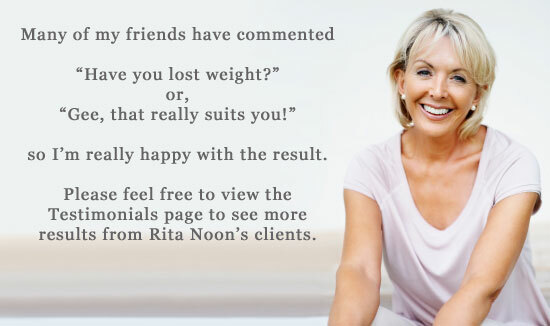 For Australian residents, Rita currently offers personal consultations, group bookings and live presentations throughout the year in Brisbane, Gold Coast, Sydney, Melbourne and Canberra. She also takes “Image & Colour Workshop Tours” throughout regional Queensland and New South Wales on a regular basis. Check the event page for upcoming sessions.